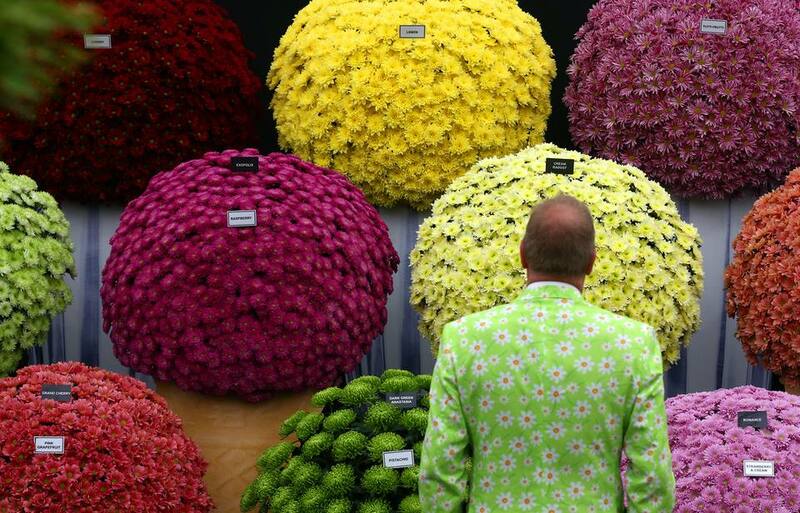 It's been a tough few years for flower and garden shows. The audience has declined and some shows have had to shut their doors or regroup. However, things seem to be leveling off and there are wonderful garden shows in just about every state. That's a good thing because, just when we need it most, horticultural societies across the country provide us with a breath of spring in the form of flower and garden shows. Some are large, grand affairs and others are just getting their footing. What they all have in common is an excitement that a new gardening season is about to begin, with new plants to try and wonderful new gadgets to make your gardening chores a pleasure. It’s worth it just to smell the damp soil and marvel at how designers can move and install an entire garden in a day or two. Floral displays by local pros and garden clubs. Wear comfortable walking shoes and bring a tote bag to carry all those impulse buys. Bring a sweater. They usually keep the temperature a little low to keep the plants and flowers looking their best. The best time to take in a show is on a weekday evening. By 4:00 pm, most visitors are making their way back home, and the crowds are the thinnest. Many garden clubs, cooperative extensions, and other organizations sponsor day trips to nearby shows, saving you the tiring drive after you've been on your feet all day. Don't overlook the seminars and demonstrations. You'll learn a lot and the time spent off your feet will give you a second wind to walk around and learn some more. Here's a sampling of shows that take place in the spring. Maricopa County Home & Landscape Show - March, at the University of Phoenix Stadium, 1 Cardinals Dr., Glendale, AZ 85305. The SW Home and Garden Show, which debuted in 2009, has now merged with the Maricopa County Home & Garden Show. They offer a little bit of everything, home improvement, design, and landscaping, and will once again be showcasing the unique gardening culture of the southwest, where tomatoes ripen in winter and giant saguaro cactus share space with lavender hedges. San Francisco Flower and Garden Show - April, at the Cow Palace, 2600 Geneva Ave, Cow Palace, CA 94014. The show has a broad range of displays, exhibits, and seminars. Local schools are invited to participate, by having classes design container gardens for exhibit. Colorado Springs Home & Landscape Show - February, at the Norris-Penrose Event Center. Another indoor-outdoor show with exhibits and demonstrations for all areas of your home and garden. Connecticut Flower & Garden Show - February, at the Connecticut Convention Center, 100 Columbus Avenue in Hartford. There are usually over 300 garden vendors, about 80 hours worth of seminars and 45,000 sq. ft. of displays to remind you that spring is just around the corner. Epcot® International Flower & Garden Festival - February-May, at Epcot Center, Orlando. All the Disney attractions are known for never having a flower out of place, so you can just imagine what it's like when they decide to put on a show. The spring show is presented by HGTV. Expect lots of color and over the top fantasy with Disney character topiaries. Here are some photos from a previous show. After several years without a show, the Atlanta Botanic Garden has resurrected the Southeast Flower Show on their grounds, as an annual event. Boise Flower & Garden Show - March, at Boise Centre on the Grove. Displays, seminars, and lots of shopping, from plants to decor to furniture. Wine & Jazz Night continues. The Chicagoland Flower and Garden Show - March, at the Navy Pier, Chicago. There are lots of great displays and lectures on all aspects of gardening and design, as well as tablescaping and The Garden Gourmet. Boston Flower and Garden Show - March, at the Seaport World Trade Center, 200 Seaport Boulevard. This is one of the oldest flower shows in the country, with exhibits, lectures, and lots to buy. The Flower & Garden Show of New Jersey - March, at the NJ Convention and Expo Center, Edison, NY. This is a great showcase for the Jersey area. The Garden Club of New Jersey is the host. GardenScape - March, at The Dome Center, just outside downtown Rochester. Capital District Flower & Garden Show - March, at the Hudson Valley Community College. This show is known for its excellent seminars and the opportunity for individuals and groups to familiarize themselves with the area's major growers. The local Master Gardeners will do soil testing and there's a Tips for the New Gardeners feature. New York State wineries also participate. Southern Spring Home & Garden Show - February-March, at The Park Expo and Conference Center (formerly the Charlotte Merchandise Mart). This Home and Garden Show encompasses a little of everything, from indoor/outdoor design to travel and shopping. There's a Green Marketplace with plants, tools, and other temptations. Cincinnati Flower Show - April, at 11600 North Lebanon Road, Symmes Township. The Cincinnati Horticultural Society recently revamped its acclaimed flower show to reach a broader audience. It does not occur every year. The Philadelphia International Flower Show - March, at the Pennsylvania Convention Center. This is still the big one. Ten acres of displays and wares, plus great seminars. Each focuses on a different theme, with each exhibit taking part. The Rhode Island Spring Flower and Garden Show - April, at the RI Convention Center. "Vintage Gardens" was a recent theme where the display gardens were paired with classic cars. Nashville Lawn & Garden Show - March, at the Tennessee State Fairgrounds. The Horticultural Association of Tennessee presents one of the largest garden shows in the south. Expect big things, with acres of display gardens, vendors from 16 states and a full line-up of seminars. Vermont Flower Show - March, at the Champlain Valley Exposition, Essex Junction. This show takes place every other year. Watch their website for updates on the next show. The MAC Events Home & Garden Show - March, at the Greater Richmond Convention Center Exhibit Hall. It seems the Maymont Flower & Garden Show is now being run by MAC events and will have more of a focus on the home. Virginia Flower & Garden Expo - January, at the Virginia Beach Convention Center. They've combined the Home Show and the Flower and Garden Show into one giant show. They've moved the date up a couple of months. Spring Capital Home & Garden Show - February, at the Dulles Expo Center, 4368 Chantilly Shopping Center, Chantilly, VA. This is said to be the largest garden show on the east coast, with acres of display gardens and over 800 vendors representing 41 states. For more info, check out About's Washington DC Guide's Washington Home and Garden Show page. Northwest Flower and Garden Show - February, at the Washington State Convention and Trade Center, 7th & Pike. This is the 3rd largest flower and garden show in North America. With 6 acres, 25 full-scale gardens and over 120 free seminars. It's run by gardeners who know what we want to see. Garden Expo - May, at Spokane Community College Lair, 1810 N. Greene Street, Spokane. The Garden Expo is held annually, the 2nd Saturday in May. There are over 200 garden-related vendors, including nurseries, garden stores, suppliers and manufacturers, garden artists and crafters, and horticulture organizations, as well as garden experts to answer all your questions. Chelsea Flower Show - May, on the grounds of the Royal Hospital. This is the granddaddy of flower shows. If you can make it there, it’s sure to be worth the trip. You’ll see the finest collections of flowers in the world and display gardens created by the world’s leading designers, all competing for top prize. Our lucky Guide to London Travel, Laura Porter, gives us the lowdown on what to expect at the RHS Chelsea Flower Show. Hampton Court Palace Flower Show - July, at Hampton Court Palace, East Molesey, Surrey. This show doesn't have the cache of the Chelsea show, but it's still a delight. With over 30 acres of display gardens added to the already existing formal palace gardens, be prepared to spend several hours wandering about. Also be prepared to buy, because some of England's best growers are there with their wares. Lots of new introductions find their way into gardens through this venue. This Guide to London Travel gives us the facts for planning our visit to Hampton Court Palace Flower Show. Canada Blooms - March, at the Enercare Centre, Exhibition Place, 100 Princes’ Blvd., Toronto, ON M6K 3C3. Canada Blooms gets better every year. The NY Times has called it one of the top 3 shows of its kind in North America. If you’d like to try your hand designing next to some of the foremost international designers, Open Hort is an opportunity for non-professional exhibitors to display. There are four different stages going non-stop with over 200 hours of seminars, workshops, and demonstrations. The Singapore Garden Festival - July, at 18 Marina Gardens Drive, Singapore 018953. This show is produced every other year. The Singapore Garden Festival "...is the first garden show in the tropics to bring together and showcase creations from the world's top award-winning garden and floral designers under one roof." It includes gardens from Australia, Germany, Japan, Malaysia, New Zealand, Sweden, South Africa, Thailand, United Kingdom and the U.S., but the tropics are the obvious draw here and what makes this show so enticing.